Epictetus was a crippled Greek slave of Phrygia during Nero's reign (54-68 CE) who heard lectures by the Stoic Musonius before he was freed. Expelled with other philosophers by the emperor Domitian in 89 or 92 he settled permanently in Nicopolis in Epirus. There, in a school which he called 'healing place for sick souls', he taught a practical philosophy, details of which were recorded by Arrian, a student of his, and survive in four books of Discourses and a smaller Encheiridion, a handbook which gives briefly the chief doctrines of the Discourses. He apparently lived into the reign of Hadrian (117-138 CE). 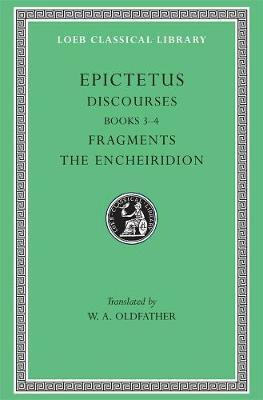 Epictetus was a teacher of Stoic ethics, broad and firm in method, sublime in thought, and now humorous, now sad or severe in spirit. How should one live righteously? Our god-given will is our paramount possession, and we must not covet others'. We must not resist fortune. Man is part of a system; humans are reasoning beings (in feeble bodies) and must conform to god's mind and the will of nature. Epictetus presents us also with a pungent picture of the perfect (Stoic) man. William Abbott Oldfather (1880-1945), one of America's most important classicists, was a professor at the University of Illinois at Urbana-Champaign.